These Christmas cards depict a photo print of the Lesotho wool Nativity that we sell. 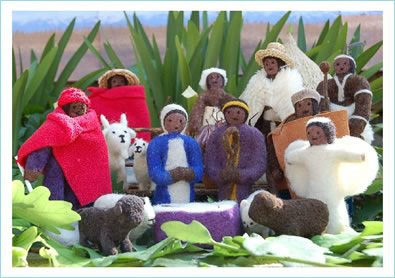 The photo was taken by an Irish woman who lives in the Lesotho village where the wool figures are made. She arranged the figures in her flowerbed as the backdrop, much to the amusement of the African ladies and children in the neighbouring flats who found it a strange sight to see an Irish lady playing with dolls in the bushes! Each pack contains 6 identical cards and envelopes. The inside of the card reads, “Happy Christmas” in both English and Sesotho languages. Information about the Lesotho Nativity and the women who make it is printed on the back of the cards. The cards measure 6 inches by 4.25 inches. $6 for six. Please click here for purchasing instructions.